Beijing’s parking woes: Is there any end in sight? Beijing’s motor vehicle ownership has reached 5.4 million, ranking it first out of all Chinese cities in motorization. To combat parking shortages, the Beijing Municipal Commission of Transport recently announced the addition of over 13,000 parking spaces to the city’s center – but that might not be an optimal solution. Photo by Leo Fung. What do the time-honored hutong – quintessential narrow alleys of Beijing that date back to the Qing dynasty – and danwei – organized work and housing complexes from the pre-1979 era –have in common? Apart from the fact that neither has been replaced by modern buildings, one of their major similarities is that they were designed to serve pedestrians, not cars. However, as Beijing’s rate of motor vehicle ownership escalates, even hutong and danwei residents are opting for cars. Because the densely-populated central city, an area with over 23,000 people per square kilometer, is inherently at odds with intensive car usage and massive parking lots, continued motorization is exacerbating the challenges to sustainable urban mobility in Beijing. 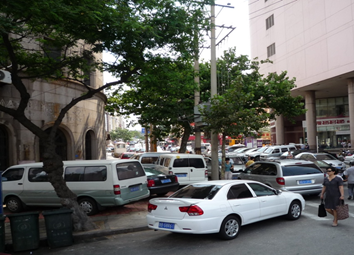 In late October, the Beijing Municipal Commission of Transport announced its solution to growing parking demand: increasing the number of parking spaces by over 13,000 during the coming year. Although parking shortages are certainly escalating in Beijing, the government’s sole emphasis on accommodating increased private motorization may not be an optimal solution. 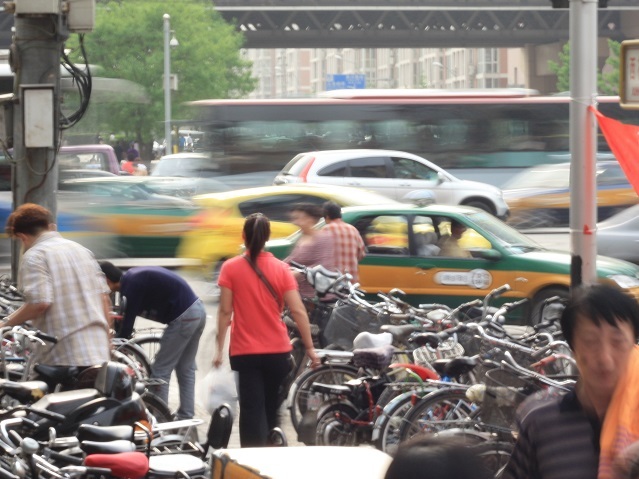 As China’s capital city, Beijing has an incredibly high concentration of both population and private motor vehicles. The total motor vehicle ownership in the city has reached 5.4 million, which ranks Beijing first in motorization out of all Chinese cities. The urban core, including Xicheng and Dongcheng districts, has the highest vehicle density at 310 motor vehicles per 1,000 people – about 60 more vehicles than the city’s average. Compounding this intensive motorization is scarce land resources. According to the Beijing’s 12th Five Year Plan (2011-2015), new real estate projects are strictly forbidden within the Third Ring Road, a 48 kilometer (29.8 mile) road that encircles the city’s center. Despite this rapid motorization, appropriate parking provisions have long been overlooked. The city’s first ever minimum parking requirement established in 1994 is still in effect today. The minimum mandates at least three residential parking spaces be provided per ten dwelling units even though Beijing’s current car ownership is about seven cars per ten households. On top of poor regulation, adding more parking spaces usually means a higher rent cost due to the increasing land prices. With the gap between supply and demand widening, the parking problem spillover is becoming prominent. Parking encroaches upon bike lanes, sidewalks, bus lanes, and fire passages. It also clogs streets, posing threats to traffic safety and air pollution, along with inducing disputes over parking spaces. In Beijing, parking often encroaches on sidewalks and forces pedestrians to walk in the street. Photo by Lulu Xue. Additionally, the city’s planning bureau is also contemplating raising the minimum parking requirement from 1:0.3 to 1:1. If this new ratio is enacted for all new development, each dwelling unit will be equipped with one parking space. The increase in car ownership will still outrun parking supply. Despite existing car ownership restrictions, the number of motor vehicles in Beijing increased by 0.2 million in 2012, tremendously exceeding the planned 0.01 million parking spaces. The new parking spaces will quickly fill up as car ownership catches up. It’s not technology but rather price that matters when it comes to parking management. The price of surface residential parking is regulated at a low rate – no more than 120 Chinese Yuan ($19.70 USD) per month – whereas privately provided structured parking usually comes at a much higher cost. Without getting the public-provided parking prices right, the efficient utilization of parking structures like the proposed vertical, outside, and underground lots cannot be achieved. Structured parking options like these have been previously tested in Beijing but were quickly priced out of the market, due to the low cost of surface parking. Adding parking spaces may come at the cost of recreational public spaces, and the right-of-way of pedestrians and cyclists. Beijing has already seen road spaces taken up by parking, which has disrupted sidewalks and bike lanes. The Government’s new measures are too vague on how pedestrians and cyclists’ rights will be protected. Parking shortages are not unique to Beijing – a host of Chinese cities are confronted with similar issues, and their municipal Government’s reactions have been almost exactly the same. Alternative measures including parking freezes, higher surface parking charges, and proof-of-parking are strategies that were deployed by cities like Tokyo and Hong Kong when they faced the same dilemma. Although Beijing’s context differs, it could still draw inspiration from these other major Asian cities. However, taking that first step will require a change in mindset: accommodating car growth and usage is no longer practical for densely-populated Chinese cities. Will raising Beijing’s subway fare be enough to improve service quality and combat mounting subsidies?